I wrote this maxi dress post a few years ago so I am going to take a moment to update it with some links and useful information. The original post I’ll leave below italicized. I made this dress for my sister for her birthday a few years ago and it turned out so good! I used a really simple white tank top and sewed it inside out into a basic a-line skirt. Sounds complicated but it was really simple. Here are the details. Since the original post a few years ago, I have drawn up this really simple, sketchy pattern. I used a tank top for this dress very similar to this one. A basic white tank top in jersey knit or ribbed material will work well. Along with the white tank top, you’ll need a nice printed fabric, I used a chevron fabric like this. You’ll also need a special kind of thread called elastic thread and a few other things, here is a complete supply list. 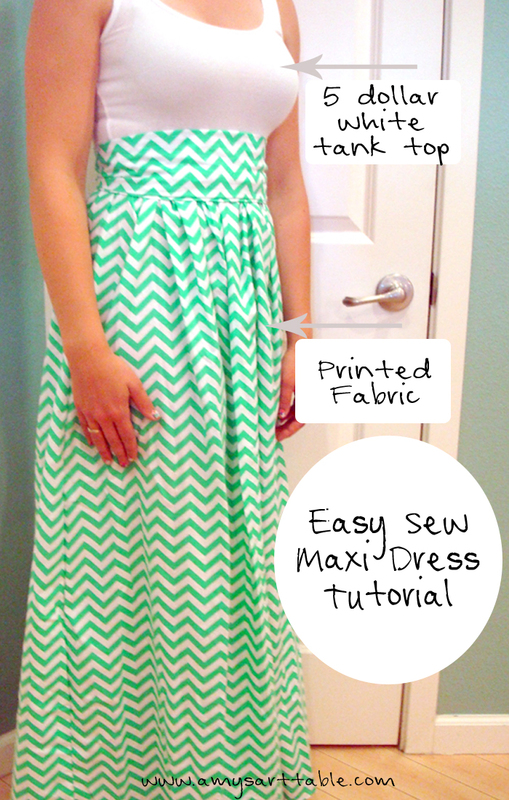 With the help of these two older posts, sewing a maxi dress should be pretty simple. This one is a detailed tutorial update and this one will show you some good images on the process of sewing the shirt into the body of the skirt with the elastic thread. After you have figured this process out, sewing a maxi dress for yourself, friend or little one will become a breeze. You can always contact me via email with any specific questions or leave a comment and I’ll be happy to help. Check my Family DIY tab for a lot of other DIY projects and Art tab for Art lessons. Happy creating! I’ve been looking at a tutorial for sewing a maxi dress for a few months now and wanting to try it so when I saw this green chevron fabric I knew I had to try it for my sister’s birthday. I got motivated and tweaked the original tutorial a bit so that I could make an a-line maxi. Sewing is one of my favorite hobbies but it is Hard. My love of sewing comes from my mom who is an excellent seamstress and I so wish I had her talent of whipping out clothes from scratch but I’ll need a few more years of practice for that. I found this amazing tutorial though and I have to share it with you because I think even a novice seamstress like myself, could pull it off. The tutorial I used for this maxi dress is from a small snippet and it uses a regular ribbed tank top that you can purchase at target! I love it. What do you think? Next I want to try this tutorial from the Winthrop Chronicles on how to sew maxi skirts, I’m plotting to live in them after the baby arrives and its 100+ degrees everyday! For another quick maxi skirt idea check out this one I made! For the tutorial pattern update on this Maxi please see here! Do you have a pattern for this? I would love to have one. I have an updated tutorial with a pattern here: http://www.amysarttable.com/2014/04/07/sewing-maxi-dress-tutorial-update/ hope this helps!! This is so cute. You did a great job. I love the chevron maxi skirt. I read the directions a few nights ago and tonight can’t find them. Can you tell me where the directions are? Sure! I think you are referring to this tutorial But I made mine from this tutorial, hope this helps! Yes that is it! Thank you, I am so excited to make one and this looks so simple and so great! Your maxi is super cute. I made one last night using the link to the tutorial. Is your sash attached to the skirt? If so, how did you do it? I left the sash unattached so that it could be placed easily and adjusted and ironed 🙂 If I were to attach it I’d probably attach it at the side seams by hand. I’d love to see how your dress turned out! !